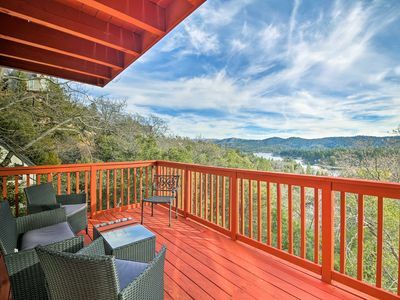 Slip away into a Southern California dream while staying at this 4-bedroom, 3.5-bathroom Lake Arrowhead vacation rental house. 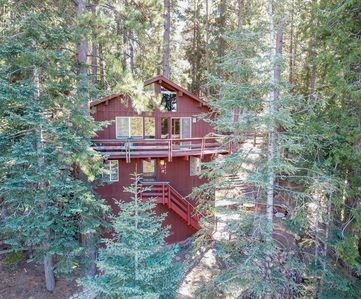 Nestled in the San Bernardino Mountains, this property provides up to 13 guests with numerous amenities, a convenient location and incredible views from a private deck, creating the perfect home base for exploring the scenic area. 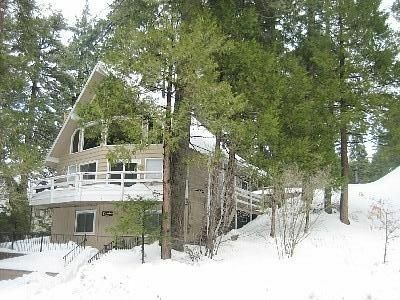 You'll enjoy seasonal outdoor activities including swimming, hiking, boating, skiing, snowshoeing, and so much more while staying here! 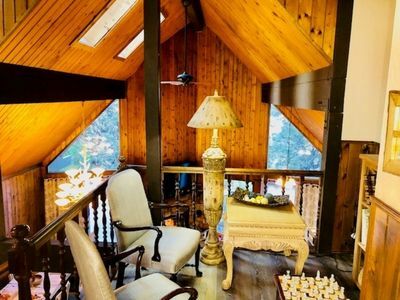 Upon arrival, high-beam cathedral ceilings and a towering wall of windows seize your attention as you settle into the 2,300-square-foot interior. 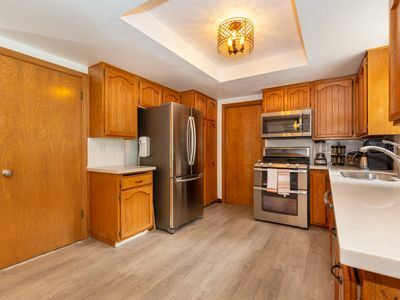 The windows provide a clear view of the newly constructed deck, where you’ll spend hours cooking out on the gas grill, dining around the patio table and taking in the lake vista. 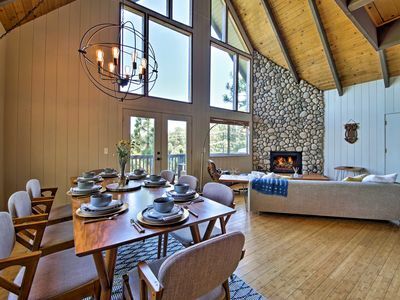 Light and airy, the spacious living area invites you to unwind in front of the fireplace, which is set into a stunning stone accent wall. 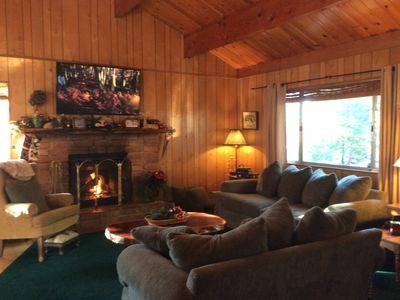 Find a spot on the plush sofa in front of the flat-screen cable TV mounted next to the fireplace, or challenge your fellow guests to a competitive game of foosball. 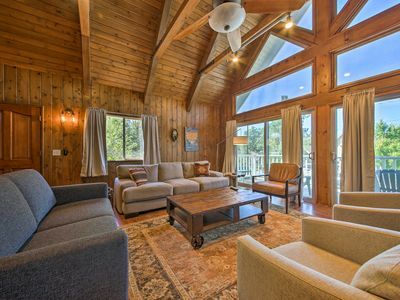 Before calling it a night, step out onto the second-story sun porch to take in the starry night sky. 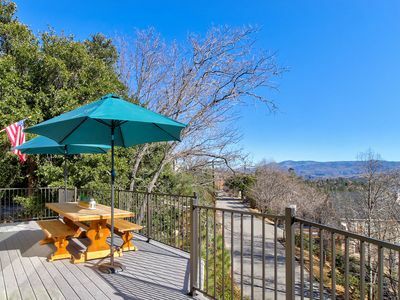 Furnished with abundant Adirondack chairs, this outdoor space is the perfect place to relax and reconnect after a long day on the lake. 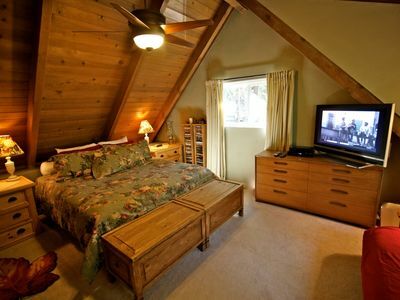 The master bedroom is distinguished by a king-sized bed, full en-suite bathroom and a sliding door to access the deck. 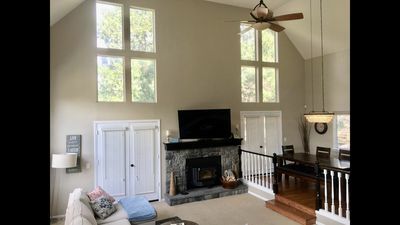 Guests staying in the second bedroom will enjoy access to the sun porch, while those in the third bedroom will have the convenience of a private en-suite bathroom. Larger groups will enjoy the convenience of a queen-sized pullout bed in the living room as well as an additional rollaway cot! 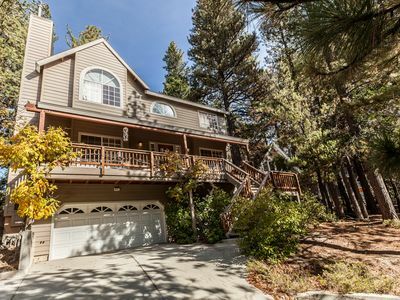 Experience a peaceful getaway at this property with views of Lake Arrowhead, the San Bernardino Mountains, and beautiful foliage including pine, cedar and dogwood. 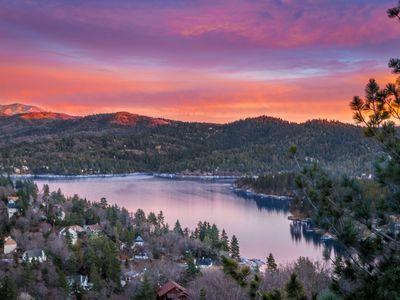 You’ll fall in love with this mountain resort town that offers guests a chance to experience numerous outdoor activities including hiking, horseback riding, water and snow skiing, and so much more! 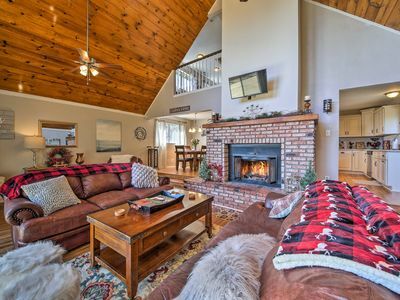 In the winter, head to one of the several ski resorts in the area including Snow Valley, Bear Mountain and Snow Summit for skiing and snow tubing. Additional winter activities include snowshoeing and winter hikes, both offered by The Big Bear Ranger Station and Discovery Center located 26 miles away. 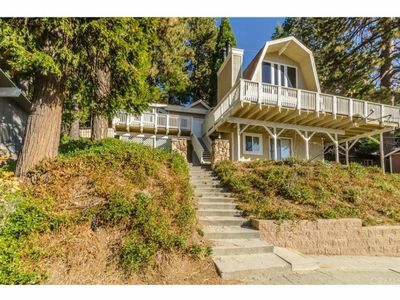 In the summer, spend sunny days playing on the shores of Lake Arrowhead. Tavern Bay is the perfect place to swim, water ski, boat and fish into the calm, clear water. 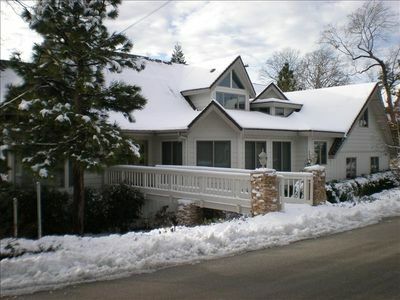 Afterwards, hop aboard the Arrowhead Queen Tour Boat to hear the lake’s history and see celebrity homes! 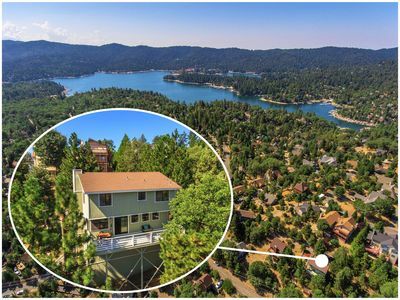 Finish the day off with a free concert on Center Stage in Lake Arrowhead Village. 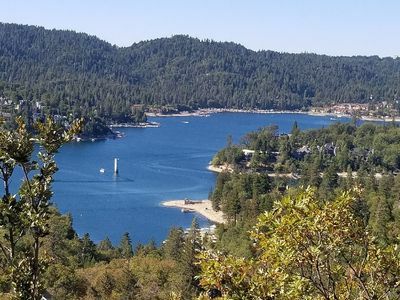 In Lake Arrowhead Village, dine at one of the delicious restaurants such as Woody’s Boat House and Village Pizza, both located only 6 minutes away. You’ll also enjoy great shopping and a spa day in the nearby area. 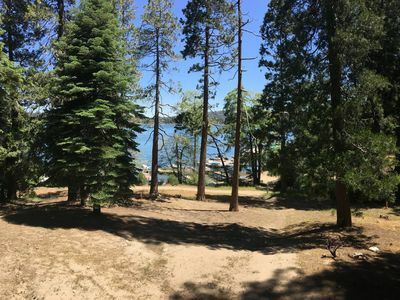 LAKE FRONT/Next to Village - SUMMER FUN!! 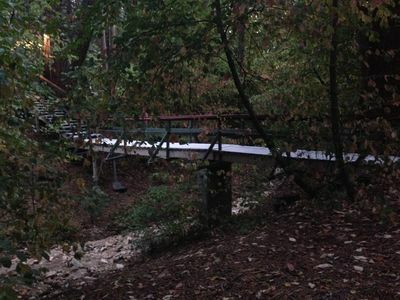 Rainbow Trout Lodge - Close to Arrowhead Village! 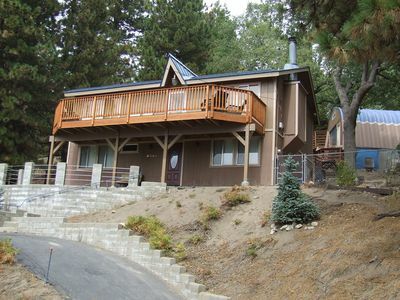 Wolf Creek Lodge - nice home in a nice neighborhood! An Amazing Place To Get Away From It All. 'Castle in the Clouds:' Spacious Mountain Retreat!